Electronical gadgets - from your smartphone over a GPS to a camera - are increasingly often accompanying us on our outdoor adventures. Even if we don't have them switched on, we have them with us - either to be able to text a loved one to let them know we're fine or call for help in an emergency, to check our position in a Blizzard or to document our adventures. But how do you keep them dry and protected from snow, rain, sweat, mud and dust? 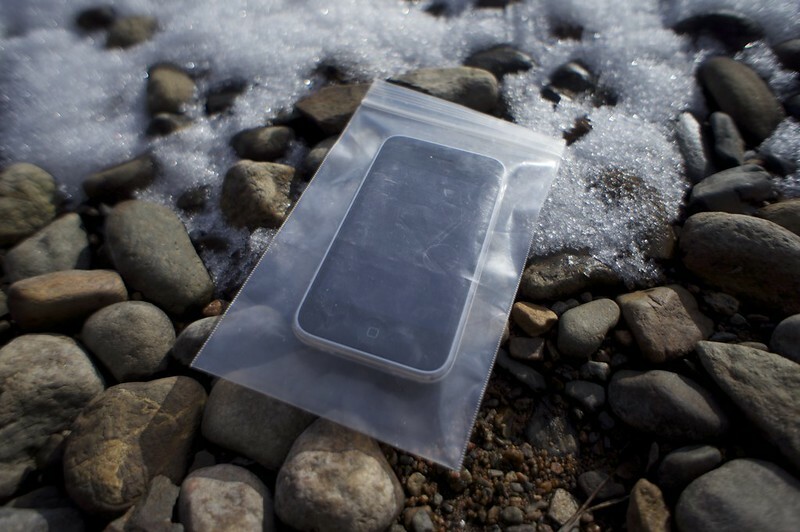 In the beginning I used Ziploc bags to keep my iPhone dry in all seasons. They work reasonably well, even allow for operation of the touch screen, and are affordable. However, they are not very durable, and depending on the modell you use their closure mechanism isn't always very reliable. The last thing you want to see is that your Ziploc bag opened and your phone is sitting in a pool of water, sweat or moisture. However, at 4 gram (for the one in the photo) you can't get much lighter and it might be all you need. So I looked for other alternatives. 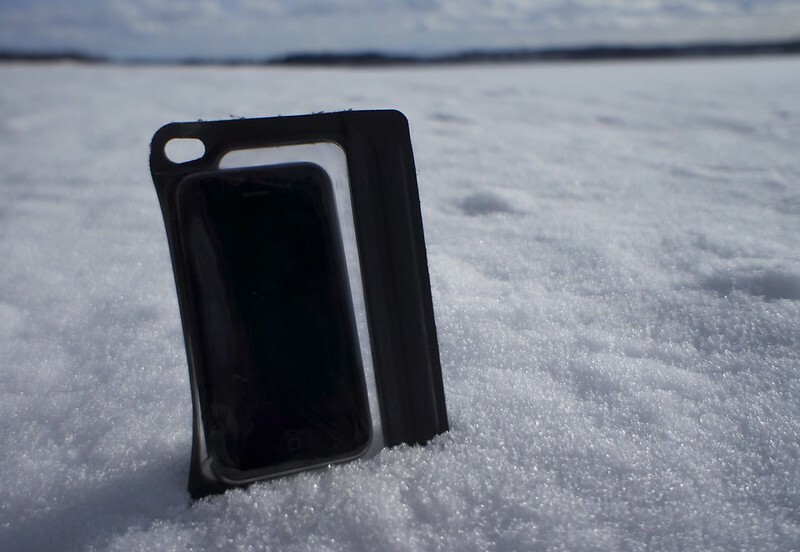 I found them at SealLine who make with their iSeries cases everything the Apple aficionado could want - from a case for my iPhone to a case for my iPad, Sealline has me covered. None-Apple user don't despair - SealLine has an eSeries which suit Nokia, Android and other phones as well as Kindles and other gadgets like GPS and Point-and-Shoot cameras. My iSeries case for the iPhone is sturdy, stays closed in all situations and weighs 30 gram. While it is a tad fiddly to get the phone in and out of the case, it fits like a glove once inside and the closure is very trustworthy and dependable - no inadvertently opening there. You still can call and operate the screen, take photos and don't need to worry to do so in the rain, snow or while packrafting. Also if you're on the trail in a desert a case might be a smart consideration to protect your phone from dust and sand, which can get between the screens in your phone and be very annoying. Occasionally I have my iPad with me on the trail - mostly to make long train trips more bearable; and in case I'm writing an article or am on a research trip for my books it can be handy to make quick digital notes to save me an extra step at home. 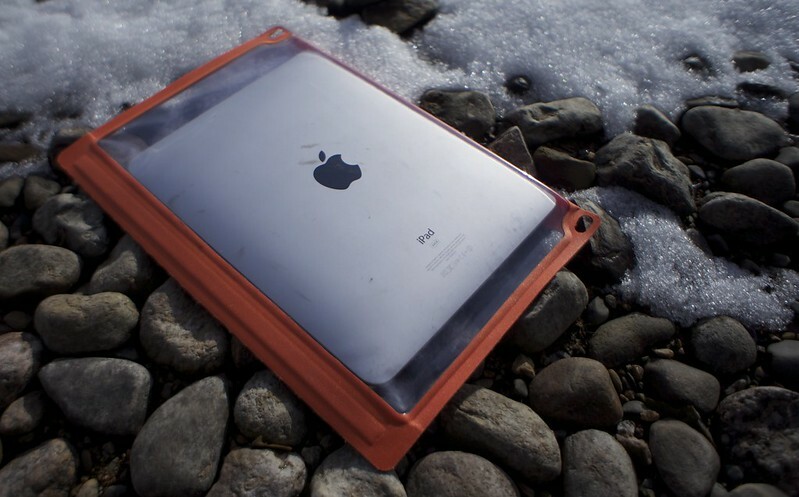 To protect it from wetness and dust I got a SealLine iPad case in nifty orange. It has the same properties than the case for the iPhone, except that it is a tad bigger! So typing and drawing are no problem, even in a downpour. The case weighs 94 gram and is a good insurance against wetness for this gadget. So that's the phone and iPad save, that leaves the camera. 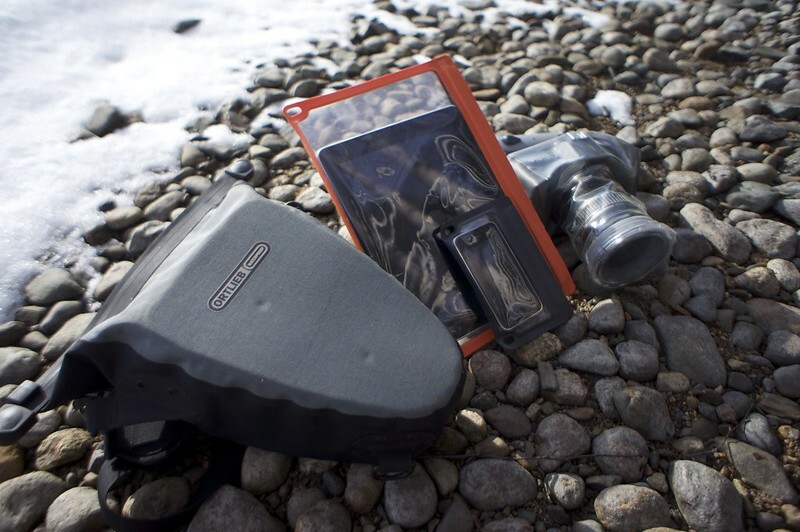 Aquapac is a UK manufacturer of waterproof camera cases, and that's where I found what I was looking for - the SLR Camera case. Especially for nautical excursions (but not exclusively - in a downpour or blizzard you don't want to take your camera out without protection!) a Aquapac case is very useful - it not only protects your camera but also lets you operate it safely, opening new possibilities for creative photography. Weighing in at 217 gram (excluding the necklace) the case fits both my Canon EOS 50D and the Panasonic Lumix GH2 and is the case to take when the packraft comes along or the weather forecast promises an epic downpour. 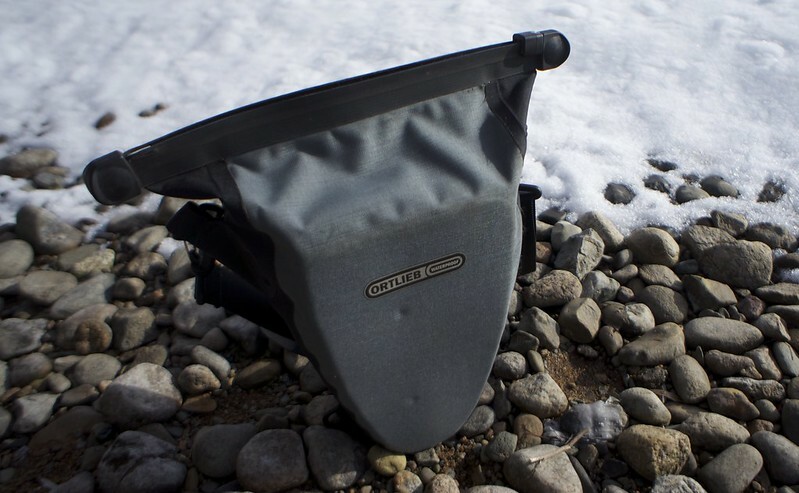 Another option is the Ortlieb Aqua-Zoom camera case which I also own. This one is more durable as the Aquapac one, but you can't photograph with it. It is very waterproof, though, and offers a bit of extra protection through inner padding. At 333 gram not the lightest, though if durability, waterproofness and protection are what you're looking for, this is the one to go for. Extra points to Ortlieb for making the case able to be worn in front of your chest. Aquapac also makes a fine smartphone case, the Mini Whanganui. At 33 gram it is a tad heavier than the SealLine, though it includes a necklace which is useful if you go paddling - that way you have the phone close by, can attach it somewhere and hence are less likely to lose it if you capsize. It has the same problem as the SealLine case of getting the phone in and out, though again - once inside it fits perfectly and allows you to use your touchscreen phone, as well as the camera, without problems. That's it! With these cases you can take your gadgets without worries of getting them wet with you on the trail; and you can text in a downpour your family that they should the kettle on while you take a photo to show them how much it rained! Here are a lot more photos of all cases. 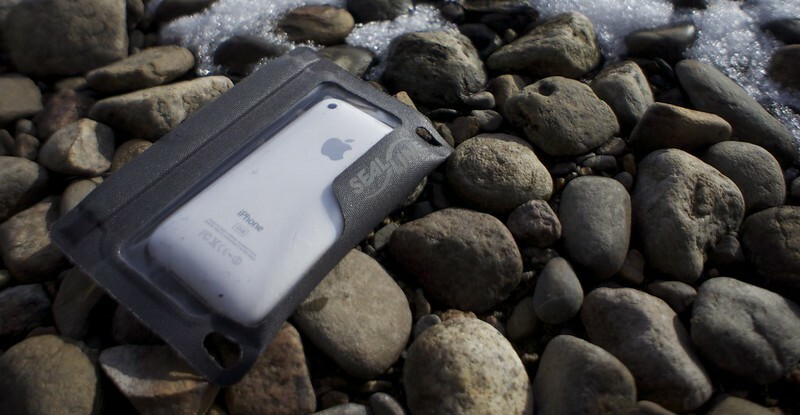 If you enjoyed this article and are looking for protection for your gadget, consider buying a SealLine or Aquapac case via one of the following affiliate links; it does not cost you anything extra & you're supporting Hiking in Finland at bit.